When one of Josiah Campbell’s professors at Central Ohio Technical College (COTC) told him about an opportunity to take part in the most recent INNOVATE-O-thon at The Ohio State University, he didn’t hesitate to jump at the chance. “I couldn’t just let it pass me by,” he said. Campbell recently reflected on his experience as one of the winners of the three-day INNOVATE-O-thon externship, organized by the Institute for Materials Research (IMR). Each semester, IMR challenges undergraduates studying a variety of disciplines to work with each other, as well as faculty, industry and government representatives to a solve real-world problem. 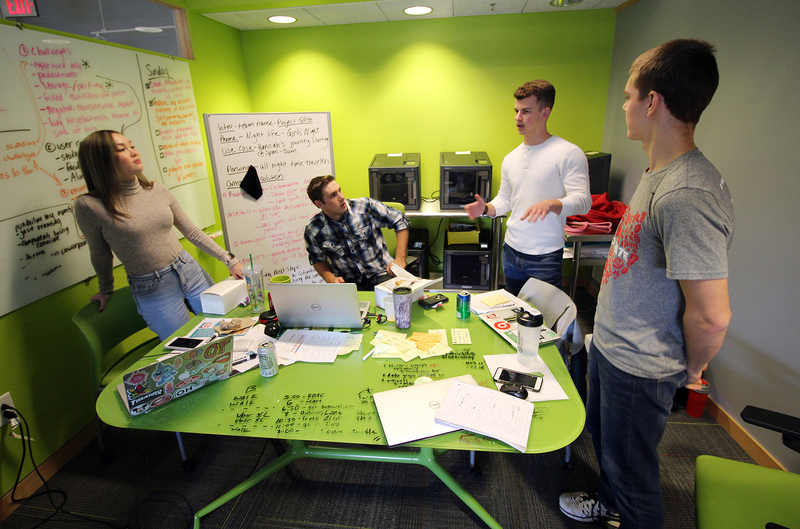 In November, students were asked to help shape DriveOhio’s technology strategy by imagining a future with autonomous shuttles on the Columbus campus of Ohio State, then build value propositions for projects of that scope. Campbell worked with three other students, two undergraduates from Ohio State and one from Columbus State Community College, at the INNOVATE-O-thon event with DriveOhio, an initiative working to advance smart mobility in Ohio. Campbell’s group focused on how autonomous shuttles might improve safety for late-night travelers in the campus area. As part of the winning group, he and his teammates were invited to be among the first to ride on the self-driving shuttles during a preview held in early December at the Smart Columbus Experience Center. Student collaborators joined from Central Ohio Technical College, Columbus State Community College and Marion Technical College through the Ohio Department of Higher Education’s Ohio Means Internships and Co-ops program and its central Ohio coordinator, the university’s Ohio Manufacturing Institute. That program and students’ experiences at INNOVATE-O-thon were highlighted in the early December episode of the Ohio Manufacturing Institute’s Manufacturing Now podcast series. Keep up with the Manufacturing Now podcast via Apple Podcasts, Google Play or Stitcher. And although Campbell was several years younger than most participants at INNOVATE-O-thon, the 17-year-old from Utica was more than capable driving his group’s success. A completed communication course helped guide small-group interactions and collaboration, while a couple engineering courses and an intro to AutoCAD under his belt helped bring the group’s idea to life through 3D modeling. “It was a really great experience. The three-day externship helped me get an idea of what my future career could be like,” he said. Campbell plans to earn a degree in mechanical engineering, he said. Read more about Campbell’s experience here. Learn more about IMR’s INNOVATE-O-thon with DriveOhio here.